Is there a third alternative? Photo courtesy of Melanie Molloy. Taken at Agua Azul, Mexico. If you’re in deep water, that’s so true. Swimming isn’t dangerous; drowning is dangerous! “Not to swim” is my middle name. 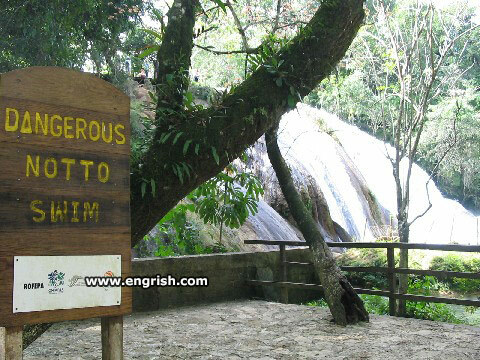 Of course it is dangerous not to swim. If you don’t swim, you will sink and drown. Weir in it for the adventure. You actually have to join a palenque to get access. It’s not really water it’s agua azul. To swim or not to swim, that is the danger. @Dr Lex 0706. Caramba hombre. Did you say flesh foods? ¡ Madre de Dios! If that waterfall is frozen – as it appears to be. HELL would freeze over first, before I would swim there. Well! I guess, banging on in the snow would be great for your fertility..
Providing one or the other of you didn’t freeze to death, before you had consummated the relationship. Just remember to drop the chalupa before you dive in. To swim or dangerous not to swim … That is the question. In a universe where Mexican fish could read English and this sign was underwater, it would make perfect sense.